Home Facebook Fanpages Facebook Tips How to HOW TO: Share Facebook Pictures and Videos on your Facebook Fanpage? 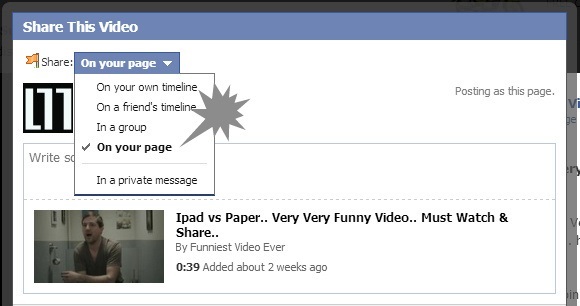 HOW TO: Share Facebook Pictures and Videos on your Facebook Fanpage? I was wanting this trick myself for a long time and here it is. In case you have a Fanpage and you come across your friends Facebook shares which are very much relevant to your Fanpage you can simply share the pic or video on your Fanpage with this very simple trick. 1. Press the Share button on the picture or Video. 2. At the top of the popup window there is a Share Drop down. 3. It has many options like your timeline, friends timeline, group or your Fanpage. 4. Select Fanpage and choose the Fanpage if you have multiple ones. Now share all the Pictures and Videos on your Fanpage and make your Fans really happy.